If you're looking for an uplifting movie to see, I recommend The Mighty Macs, released in theaters today, October 21st. This movie is based on the story of Cathy Rush, the women's basketball coach of Immaculata College in the 1970's. As Rush worked through the many challenges that faced her in her new position, I found myself drawn into the movie. The fact that it is family friendly is always a big plus for me as well. For more information about the movie, check out the website or the Facebook page. You can also find them on Twitter and YouTube. Disclosure: I was given the opportunity to preview this movie in exchange for my honest review. The opinions given are entirely my own. When Sassy Pants told me she wanted a Dora cake for her birthday, I went on an internet search for Dora cakes. I absolutely love Pinterest; I was able to "pin" several cakes that I liked aspects of so that I could use them for inspiration when making Sassy Pants's cake. I loved the colors used and the grassy area where the Dora figures were placed. I used this as my basis for Sassy's cake. I just used a round cake pan and used the pink, orange, and green color combination. I could never join the circus; I'm simply not a very good juggler. Since the beginning of this school year, I've been trying to juggle schooling the small people, being a wife and mom, keeping the house clean, and getting small people to their extra curricular activities. I've yet to figure out how to keep all of those in the air at the same time. So, if any of you have any tips for how to manage everything successfully, please share them with me. History - We finished the life of Augustus Caesar. I found it fascinating to study the people who were alive during the time Jesus was born. I hope it made the Bible facts a little more tangible to my children, that they could see that the Bible talks about real people who are a part of history and that it isn't just a group of stories. Science - The Boy was studying simple machines and completed an experiment to determine how to use a lever in the most effective way. The girls began studying the circulatory system, learning about the various components of blood. I love using Apologia for science; the chapter on blood began by discussing the importance of sacrificial blood in the Bible and how Jesus made the ultimate sacrifice for us. 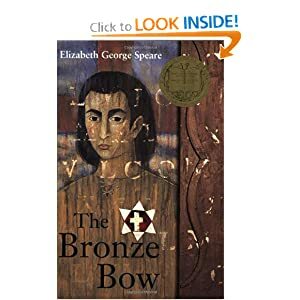 Read-Aloud - To go along with our study of the Roman Empire, we have been reading The Bronze Bow by Elizabeth George Speare. What a fabulous book! This story of a young Jewish man who wants to avenge the crucifixion death of his father and how hearing Jesus teach touched his life captivated my children. 1st Grade - Little Red was very excited to begin reading in her Bible Reader. Marie Hazell from My Father's World has retold the Bible stories in easy to read words. Preschool - Sassy Pants has mastered number recognition, so we are now working on simple addition using number pegs. Cooper and Me is an enchanting book about a little girl's apprehension about her first day of school and her relationship with her best friend, Cooper the dog. Even though her parents tell her about all of the things she'll learn and do at school, she doesn't see how she will be able to face this without Cooper. Her mother comes up with the perfect solution. Cooper and Me was illustrated by 11-year-old Alexa Peters and co-written with her mother, Monique Peters. The idea was inspired by Alexa's own experiences on her first day of school. A talented young artist and writer, Alexa wanted to give back to others in a meaningful way through her art. Starting at a very young age, Alexa created illustrated stories about her daily experiences, and from the pages of her sketchbooks came the idea for her first book, Cooper and Me. Through rhythmic verses, Cooper and Me tells the story of a young girl who is nervous as her first day of school approaches. She is frightened about leaving home and doesn't want to go without her best friend, her dog Cooper. Fortunately her mother finds the perfect solution to help the little girl overcome her fears – a small replica of her beloved pet she can take to school with her. In Cooper and Me, the story of a child’s fears about starting school has evolved into a timeless tale about overcoming separation anxiety and trying new things – basic emotions all people experience throughout their lives – but this time, written by a child, for children. The story behind Cooper and Me also offers an inspiring example of families working together to help others. In addition to helping young children gain emotional resilience and confidence through their books, Alexa and mom Monique wanted to go beyond that to help less fortunate kids. Their search for an organization to which they could donate a portion of the proceeds from the Cooper and Me book led to a charitable alliance with the Happy Hearts Fund, founded and run by Petra Nemcova, the supermodel who was directly affected by the tsunami in Thailand. Happy Hearts improves children’s lives through education and sustainable programs in natural disaster areas. I love the fact that this book was written and illustrated by a child the same age as The Boy. I used the book as a read-aloud with Little Red (age 6) and Sassy (age 3). They loved it, and it opened up the opportunity to discuss the kind of things they could do when they feel nervous about doing something new. Sassy has been having a difficult time when we drop her off at the church nursery, and we were able to use the situation in this book to talk about how we can make things easier for her. This book is available the Cooper and Me website for $12.99, and there are other Cooper and Me books and products available as well. In addition, I have one available for one of my lucky readers. The giveaway will run through 11:59 pm, Sunday, October 23. The winner will be announced the morning of October 24th. To enter the giveaway, simply visit the Cooper and Me website and come back here and leave me a comment telling me about one of their other items available.